Synopsis:After challenging an evil dragon, rescuing a beautiful princess and saving your in—laws’ kingdom, what’s an ogre to do? Well, if you’re Shrek, you suddenly wind up a domesticated family man. 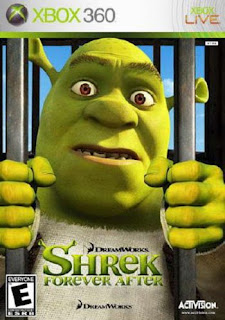 Instead of scaring villagers away like he used to, a reluctant Shrek now agrees to autograph pitch forks. What’s happened to this ogre’s roar? Longing for the days when he felt like a “real ogre,” Shrek is duped into signing a pact with the smooth—talking dealmaker, Rumpelstiltskin. Shrek suddenly finds himself in a twisted, alternate version of Far Far Away, where ogres are hunted, Rumpelstiltskin is king and Shrek and Fiona have never met. Now, it’s up to Shrek to undo all he’s done in the hopes of saving his friends, restoring his world and reclaiming his one True Love.